Summary: Python 1.x and 2.x brought some interesting ideas to the tech world, but the upgrade to 3.x has brought an astonishing number of problems in terms of version conflicts and dependency management. Python no longer offers ease of setup, as any non-trivial system will run into version problems. If you are a CTO, you should consider using a technology stack that has a long history of being stable, such as any of the languages that run on the JVM and compile to Java bytecode. Despite the fact that PHP has some hilarious essays about how broken it is I used to enjoy writing PHP code, especially PHP 4, before they added unnecessary Object Oriented junk in PHP 5. I am happy to praise PHP for having a dependency management model that mostly works. But Python? It seems like everything is broken in Python all the time. I’ve written about this a few times lately, and I’m just struck, once again, tonight, how the simplest and most obvious things send me spiraling into lost hours, trying to figure out why some command isn’t working. configured CFLAGS: -O2 -I. -Wall -D_LARGEFILE_SOURCE -D_FILE_OFFSET_BITS=64 -Wextra -Wno-unused-parameter -Wno-missing-field-initializers -DUWSGI_HAS_IFADDRS -DUWSGI_ZLIB -DUWSGI_LOCK_USE_MUTEX -DUWSGI_EVENT_USE_EPOLL -DUWSGI_EVENT_TIMER_USE_TIMERFD -DUWSGI_EVENT_FILEMONITOR_USE_INOTIFY -DUWSGI_VERSION="\"2.0.17.1\"" -DUWSGI_VERSION_BASE="2" -DUWSGI_VERSION_MAJOR="0" -DUWSGI_VERSION_MINOR="17" -DUWSGI_VERSION_REVISION="1" -DUWSGI_VERSION_CUSTOM="\"\"" -DUWSGI_YAML -DUWSGI_PLUGIN_DIR="\".\"" -DUWSGI_DECLARE_EMBEDDED_PLUGINS="UDEP(python);UDEP(gevent);UDEP(ping);UDEP(cache);UDEP(nagios);UDEP(rrdtool);UDEP(carbon);UDEP(rpc);UDEP(corerouter);UDEP(fastrouter);UDEP(http);UDEP(ugreen);UDEP(signal);UDEP(syslog);UDEP(rsyslog);UDEP(logsocket);UDEP(router_uwsgi);UDEP(router_redirect);UDEP(router_basicauth);UDEP(zergpool);UDEP(redislog);UDEP(mongodblog);UDEP(router_rewrite);UDEP(router_http);UDEP(logfile);UDEP(router_cache);UDEP(rawrouter);UDEP(router_static);UDEP(sslrouter);UDEP(spooler);UDEP(cheaper_busyness);UDEP(symcall);UDEP(transformation_tofile);UDEP(transformation_gzip);UDEP(transformation_chunked);UDEP(transformation_offload);UDEP(router_memcached);UDEP(router_redis);UDEP(router_hash);UDEP(router_expires);UDEP(router_metrics);UDEP(transformation_template);UDEP(stats_pusher_socket);" -DUWSGI_LOAD_EMBEDDED_PLUGINS="ULEP(python);ULEP(gevent);ULEP(ping);ULEP(cache);ULEP(nagios);ULEP(rrdtool);ULEP(carbon);ULEP(rpc);ULEP(corerouter);ULEP(fastrouter);ULEP(http);ULEP(ugreen);ULEP(signal);ULEP(syslog);ULEP(rsyslog);ULEP(logsocket);ULEP(router_uwsgi);ULEP(router_redirect);ULEP(router_basicauth);ULEP(zergpool);ULEP(redislog);ULEP(mongodblog);ULEP(router_rewrite);ULEP(router_http);ULEP(logfile);ULEP(router_cache);ULEP(rawrouter);ULEP(router_static);ULEP(sslrouter);ULEP(spooler);ULEP(cheaper_busyness);ULEP(symcall);ULEP(transformation_tofile);ULEP(transformation_gzip);ULEP(transformation_chunked);ULEP(transformation_offload);ULEP(router_memcached);ULEP(router_redis);ULEP(router_hash);ULEP(router_expires);ULEP(router_metrics);ULEP(transformation_template);ULEP(stats_pusher_socket);"
What’s amazing to me is how common this is with Python. In the world of Ruby, I can use gem and bundler. Once in a while I have a problem with something like nokogiri, but Ruby Bundler mostly works. And in the world of Clojure, I’ve never had a problem, because Leiningen is best build tool ever created. This gets me the same error. A curious fact: when I ask my co-workers “Why has Python gotten so popular over the last 10 years?” one of the main answers I’m given is “It’s really easy for beginners to get started”. And yet, for me, when I was a beginner, one of the main things I wanted was the ability to write code without having to dig deep into the internals of the system that I was using. Back in 2001, when I wrote PHP code, I could write all day without having to think too much about the way PHP connected to port 80 on the server. 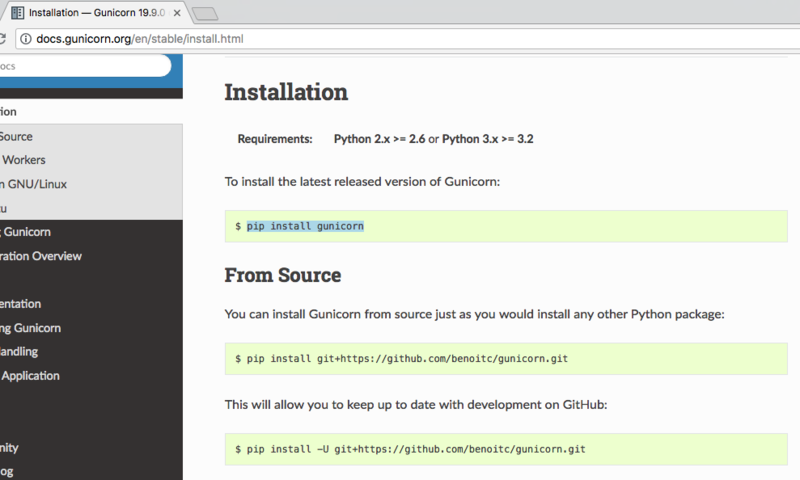 But in Python I have to think about it, and the dependency management system is broken, so I can’t just install the libraries I need. I seriously do not get why the tech industry is sticking with Python. And not just sticking with it, but doubling down on it. As near as I can tell, Python is rising in popularity, even as PHP and Ruby die away. “Easy for beginners” was Hypercard, and I loved writing stacks back in 1994, and the C extensions were easy to install. And 24 years later have passed, and “Easy for beginners” seems to have gotten much more difficult. How is that even possible? 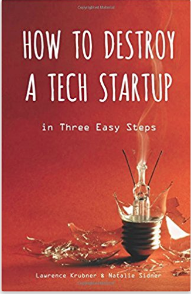 Why is the tech industry going in the wrong direction? I know I’ve complained, on this blog, about the times when Ruby Bundler can’t compile Nokogiri, but that seems minor compared to the version conflicts in Python. Hmm, maybe this is a version conflict, so let’s upgrade everything. I feel badly that I ever complained about dependency management in the world of Ruby. Whatever problems Ruby has, they seem like a dream compared to Python. I’ve really never worked with an eco-system where the dependency management is as broken as what I face in Python. And there is also the fact that the number of conflicts are nearly infinite, and the systems seems creative in finding new combinations, so I don’t seem to be able to find my errors on Google. 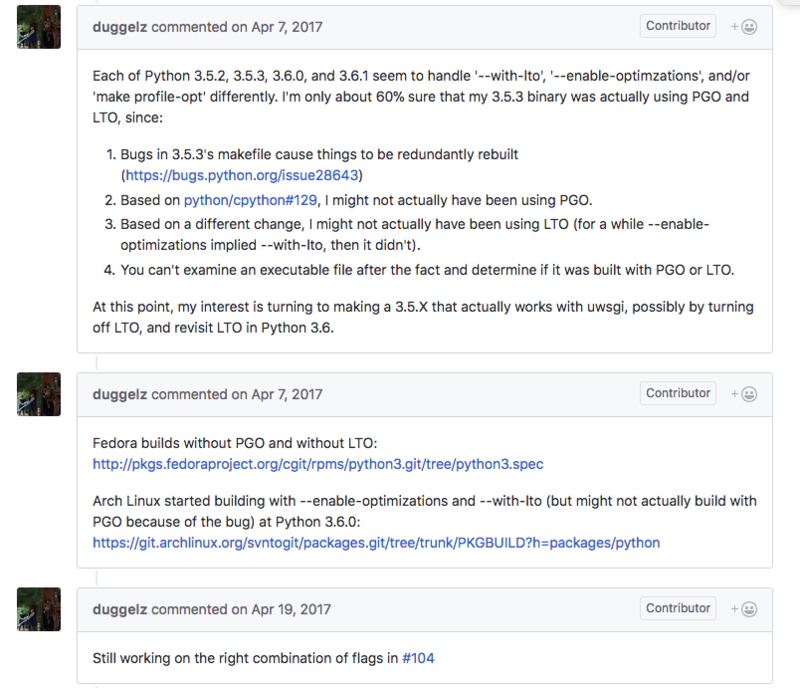 This leaves me with the impression that no one in the Python community is certain how to resolve all of these version conflicts. Of course, in the real world, you would never just do what you see in this screenshot. There would be several other steps. I suspect your problem is that you missed the step in the instructions where it told you to run all those commands in a virtualenv. Alternatively you can run ‘pip install’ with the ‘–user’ flag to install into your users home directory instead of system-wide. Or run ‘pip install’ as a user that has permission to write to /use/local/bin. I should add, I feel that Python 1.x and 2.x added something to the world of technology. Early Python was both easy to use, and also had the clarity of philosophy that helps beginners grip onto the world of computing, so they can start thinking about larger issues in the world of tech. Python 3.x is a tragedy. Not for the reasons normally put forward. It is a tragedy because it is rife with nervousness. The philosophy is no longer clear. Is it supposed to be object oriented? Why is it such a weird hybrid? It lacks a decisive direction. It is neither boldly object oriented nor is it a simple procedural language, nor is it a Functional language. Despite nominally having a Benevolent Dictator For Life, it feels like it was designed by a committee. It is full of the worst kinds of compromises. It feels like it made a half-hearted attempt to be all things to all people. I feel the tech industry would be better off if someone picked up Python 2.7 and continued with that line. That was a language that was easy to learn, and friendly to beginners. And the dependency management, was a bit less chaotic, if only because there were less choices.